As another round of mid-May exit interviews proceeded on Thursday morning and early afternoon at Kettler, the Washington Capitals were in strong agreement on two things. First, this is the worst recent playoff exit to date for the club. Second, the season was a failure. After Tuesday’s furious comeback attempt fell short in a season-ending overtime loss in Pittsburgh, the players tended to wear their emotions on their sleeves on Thursday. For many, it was a struggle to explain how this once-promising campaign, which featured likely the best regular season in franchise history, ended a full month before its previously projected conclusion. On the emotional side of the spectrum, Matt Niskanen looked to be by far the most defeated of the players who spoke on Thursday. 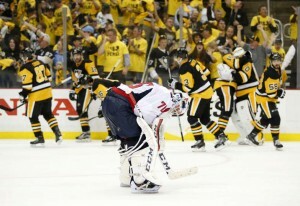 On the verge of tears, Niskanen said, “this is the most hurt I’ve been in my career. “I’ve been on some teams where you’ve got a pretty good chance, and because of the people on your team you always think you have a chance. But this sure felt like the year. It hurts right now. I don’t have a perfect answer for why it didn’t come about and why it didn’t happen for us. “I’m not a general manager or anything,” Niskanen continued, “but I think we’re pretty well set up to go at it again. That’s the positive in all this. I think we went after it this year and guys left it out there. As far as personnel matters are concerned, Trotz said that general manager Brian MacLellan will prioritize contract discussions with the team’s pending restricted free agents (Johansson, Tom Wilson, Dmitry Orlov and Michael Latta) before entering talks with unrestricted free agents Jason Chimera, Mike Richards and Mike Weber. Trotz also said that he had no regrets about any specific decisions he and his staff made over the course of the postseason. “We talked about [decisions made] as a staff,” he said. “For the most part, we talked really thoroughly about every decision we made, from lines to defense pairings to who comes in and out. Injury-wise, the ailments of several members of the team came to light, in some cases months after the healing process had completed. Ovechkin said the injury that kept him out of the All-Star game involved his lower back, but had been healed for some time. Brooks Orpik suffered a break to his femur (thigh bone), plus a Charley horse during the regular season and a concussion and neck injury in the playoffs. He will give them time to completely heal, but will not need surgery and expects to be back to full health for training camp in September. Johansson said that he’s had “some stuff” to fight through but refused to detail those issues further. He did add that he will not compete in the World Championships for his native Sweden because of the injury, but also does not anticipate needing surgery. Ultimately, the group sentiment on Thursday was one of extreme disappointment coupled with a fierce desire to ensure that 52 weeks from now, they will be facing the media in advance of the Eastern Conference Finals rather than another early summer.